All of you who have been waiting for the Galaxy Note Edge, and have put your Note 4 purchases on delay, there’s good news in the Samsung Galaxy Note Edge territory. The Korean manufacturer is speeding things up in Note Edge territory, with the device with the Galaxy Note Edge made available for folks over in the UK, for pre-ordering. Galaxy Note Edge available for pre-order in the UK. For those of you in the UK, you can learn more about the Galaxy Note Edge’s pre-ordering here. 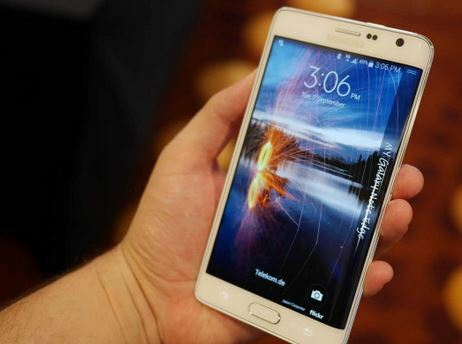 The Galaxy Note Edge was shown by Samsung along with the Galaxy Note 4 this year. For folks over here in the US, this could be a good reason to hold of your Note 4 purchases this Black Friday. The Galaxy Note Edge is the first of its kind in tablets to display your notifications in a complete new space. The device will be available in Charcoal Black and Frost Wide. Specifications remain similar to those found on Samsung’s Galaxy Note 4. The device features a Super AMOLED, 5.7 inch curved screen with a resolution of 1440 x 2560. Processor for the Galaxy Note Edge is a Snapdragon 805, with a frequency of 2.7 GHz which will be coupled with 2 GB of RAM and 32 or 64 GB of internal storage. However, since the device is being launched with the Snapdragon 805 on board, which is 32-bit in nature, you shouldn’t expect it to have complete functionality with Android Lollipop. Google’s latest OS is 64-bit in nature, which is one of the major changes introduced in this year’s update. Camera specifications for the Galaxy Note Edge include a 16 MP rear camera with OIS and a 3.7 MP front camera. The Galaxy Note Edge’s launch in the UK is good news for all Samsung fans out there. But will you be purchasing the device if it comes only with the Snapdragon 805? Let us know in the comments section.